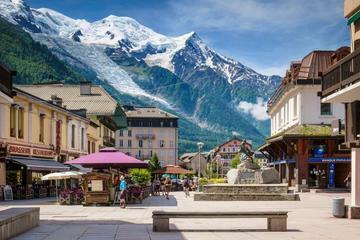 Besuchen Sie Chamonix auf eine Weise, die Ihnen am besten mit dieser individuell anpassbaren Tagestour aus Genf zusagt. Entscheiden Sie sich für eine Transfer-Option, um die hübsche französische Bergstadt mit minimalem Aufwand direkt von Ihrem Hotel zu erreichen, oder wählen Sie die volle Paketoption, um auch Tickets für die Aiguille du Midi Seilbahn und die Montenvers Eisenbahn aufzunehmen. Andernfalls, protzen Sie auf dem All-Inclusive-Tagesausflug, den Teams Transport und Tickets mit Mittagessen in einem der renommierten Restaurants in Chamonix. This tour was fantastic. Montblanc is a powerful mountain that provides a different view at every turn. I was captivated by its magnificence and could have spent all day here. The train ride to the Ice Cave was ok, there was not alot of time on this part of the tour. I did not have enough time to go down into the glacier as the ques for the train down were too long. Those on the tour who went strait to the glacier were very late coming back, which frustrated our guide. The trip is well worth it for Montblanc! Great day trip back in June. Picked up on time- amazing audio commentary in English on the way to Chamonix and around the town. Driver was friendly and professional. Thoroughly recommend this day trip if you have some time to kill in Geneva. Our recent trip was fantastic. We saw so much and loved every minute of it. Our transportation with GVA Transfers was great. The vehicle was very clean and comfortable. The hotel pick up was very convenient and very prompt. Our driver Evan was the best. He provided so much information about everything we were seeing. He provided time for pictures along the ride. I would highly recommend this tour and the travel provided by GVA. Stunning village. A great variety of shops. Easy to negotiate shops and streets i.e. no steps and steep elavations. This was my favourite day of my three weeks in Europe. Stunning views at the top of the cable car. Electric train was a nice ride, but I am not sure the ice tunnels are worth the scores of steps down and up. Even without the cable car rides, this village is stunning, maybe even more beautiful from the village than at the top of the mountain. The trip is basically just transport to the village, and the guide tells you what to do with the tickets etc. If you booked the lunch option, he basically will walk you to the restaurant for a three course lunch - which when it is busy, may take more than an hour. Personally, I enjoyed exploring the town and buying my own lunch as there was plenty of take away options that were totally delicious. BEWARE - our driver told us that the other driver would collect us at 5pm. This other driver drove off at 5pm because when he was asked three for Geneva, he thought he was being asked if he was a taxi, and said no, this is a private tour bus and drove off. Lucky one of the guys with me had the previous driver's mobile number, as this first driver had to call this other one to turn around and pick us up. Part of the problem is that the second driver wasn't told how many people he was expecting and so didn't realise he had to wait for us three but we were on time. There are trains to Geneva - if you find yourselves being left behind! Make sure you have a contact mobile number! You could maybe pre-book the cable car and do this trip yourself - not sure how much cheaper it would be. But it was easy to be collected from the hotel and go straight up the cable care - avoiding the very long queues. Great day in this quaint village. The scenery cannot be beat! It was beautiful! The only criticism is that there were many stairs to get up and down to see the glaciers. The tour guide should have told us this. There was not enough time allotted to see and do everything, so we were running at the end to catch the last train down to get back to the van on time. My 20 year old son had no problem doing this, but us older ones need a little more time, especially considering the altitude changes. We were not able to see the town at all. Just wasn't enough time. It was a nice excursion. We were driven to Chamonix and shown to the Cable Car Ride and Train Ride which we were to take by ourselves. The lunch was good but service at the restaurant was very very slow. We waited at least 10 to 15 minutes between courses and this ate into our time for the train ride to the Glacier. Me and my Wife had a super excursion to Chamonix. We received excellent service from this company and we would would only recommend to other travellers. Thank you for a great day.. I recently had a wonderful trip with Gva Transfers to Chamonix. The driver who collected me, who's name was Thomas was on time and his bus was clean. I sat close to the driver and everyone was offered refreshments. The journey was smooth and Thomas explained some history about Chamonix and the things we would get to see and do. We were escorted by Thomas to the Mt Blanc Cable car and given our priority passes. The journey to the top took around 15 mins. It was probably the best view I have ever seen and felt like being on top of the world. Later when we came back down- Thomas was waiting for us and recommended a great place to eat and then accompanied us to get some incredible french pasteries and coffee. After our feast we were taken to the Montenvers train to visit the sea of Ice, This was stunning- so stunning that I was around 10 mins late to get back down and meet the rest of the group. However no worries as the minibus and Thomas were there and the air con was firing!!! 1 hr later Im back at my hotel in Geneva - Thanks for a great trip- perfect from start to finish. DO NOT RECOMMEND IT. OVER PRICED, POOR FOOD, POORLY DONE.